Despite a sore throat that made her voice hoarse, French Minister Fioraso gave a live interview to regional TV with the Seismic Pit as a backdrop. Another few weeks and it would have been too late: as formwork on the Tokamak basemat is set to begin, the site visit that was organized last Thursday for the European Commissioner for Energy, the French Minister of Research, guests and the media provided one of the last opportunities to take in the spectacular setting of the Tokamak Seismic Pit, open to the sky. Knowingly or unknowingly, the visitors all made the best of the outing. Despite a sore throat that made her voice hoarse, French Minister Fioraso gave a live interview to regional TV with the Seismic Pit as a backdrop. 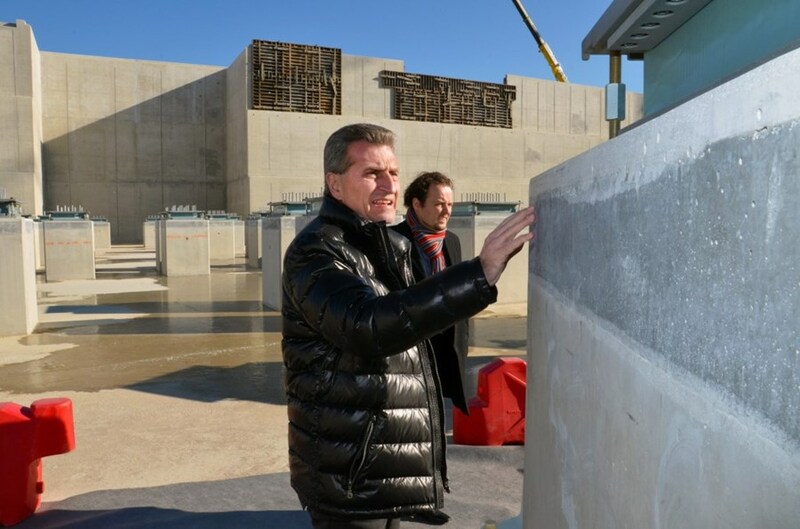 Commissioner Oettinger, deliberately walking ahead of the group of officials, took a solitary stroll through the 493 plinths and seismic pads, closely examining the concrete finish of the columns and the rubber and steel bearings. Commissioner Oettinger, deliberately walking ahead of the group of officials, took a solitary stroll through the 493 plinths and seismic pads, closely examining the concrete finish of the columns and the rubber and steel bearings. As for the press, it was a rare occasion to have the main ITER actors, both international and local, gathered in one place: the European Commissioner, the French Minister, the ITER Director-General, the High Representative for ITER in France Bernard Bigot, Agence Iter France and Fusion for Energy officials, and local contributors to the project. All were available for questioning and visibly enjoyed answering media requests despite the brisk January wind. The power of attraction of the ITER work site is such that additional tours had to be organized later in the afternoon for members of the diplomatic corps, photographers and cameramen. The latter were particularly satisfied: it is in the late afternoon winter light that the ITER work site is at its best. Watch the live interview of Minister Fioraso on France 3 regional TV here (begins at 4'26'').